Looking For The Best Hotel In Jammu? Katra Is Where You Should Be. The Vaishno Devi shrine is one of the most popular pilgrimage sites in India. Every year, millions of people climb up the mountain to bow down before the Goddess Vaishno Devi and seek blessings for themselves and their families. When people plan this pilgrimage, they often search for the best hotel in Jammu. Katra, however, is a much better place to stay. The starting point for the 12km trek to the Vaishno Devi shrine is is Katra. Here, every pilgrim must register himself or herself before starting the journey. From Jammu, this is almost a two hour drive. 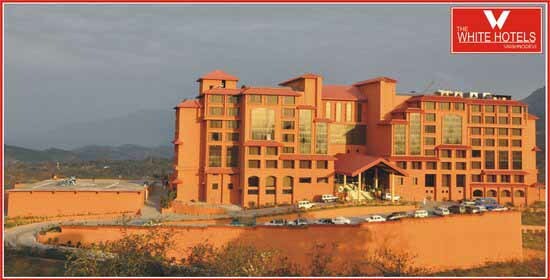 On the other hand, many good hotels in Katra are just a stone’s throw away from the registration center. Thus, if you were staying in Jammu, you would have to start earlier and your trip would be atleast 4 hours longer. Jammu is a big city and the closest airport to the Vaishno Devi shrine. This is probably why most people look for the Best hotel in Jammu. Katra, like Jammu, has many different types of hotels. Hotels here range from simple, homestays to luxury resorts. These hotels offer air-conditioned and non-air conditioned rooms with all the modern comforts a person could need. This includes restaurant service, room service, parking, ATMs on the premises, etc. Vehicles can go up to Katra but from there, one must trek or take a pony ride up the mountain to reach the temple. People who cannot walk such a long distance or ride a pony may travel by palanquin instead. If you choose to stay in Katra, the hotels will be able to help you liaison with porters, palanquin bearers, pony operators etc. This can help make your journey to the shrine easier and more comfortable. Katra is well-connected to Jammu by road as well as by rail. Thus, if you fly in to the Jammu airport, you can take the bus to Katra or hire a taxi. Many taxi services also offer per seat rates if you’re travelling alone. Alternatively, you could hire a car and drive down yourself. The road is well-maintained and quite picturesque. Travelling by train may take slightly longer than travelling by road. However, there is no dearth of options. There are about 19 trains that connect Jammu and Katra. 4 of these trains run every day. For many people, a trip the Vaishno Devi shrine is a once in a lifetime pilgrimage. Many people combine this pilgrimage with a trip to other tourist places like Patnitop, Dalhousie, McLeodganj, etc. To be most comfortable, make your travel arrangements and hotel bookings at least a month in advance. If you’re planning to see other places as well, this will help ensure you get the best deals on a The White Hotel in Jammu. Katra, could be the place you stay in just before and after your trek.